We pick up where we left off, Hal is still transporting Highfather in the jet he constructed with his ring. Omega beams still firing full blast after them. Back on planet Mogo at the Green Lantern Corps headquarters, Kyle Rayner has been holding the blood circulation construct with his ring for 27 hours, and he won’t be able to hold it for much longer. His construct is what is keeping Orion alive. Two-Lobe, our telepathic Green Lantern, continues to probe unconscious Orion’s memories. They need to find out were these Metal Golems are going next. Two-Lobe utters the name “Yuga Khan,” to which Lantern Stewart urgently responds by gathering the Attack Platoon. Their destination, the Source Wall! Now I just want to take a moment to define our terminology and make sure we all have a good understanding of what is happening here. What’s the Source Wall you might be asking? The Source Wall is literally a trippy/creepy looking wall that lies on the edge of the known Multiverse. On the other side of this wall is what our DC Universe calls the Source. The Source is a celestial essence that is the cradle of all that exists. The Source Wall is tentatively penetrable but all who have tried to pass through fail and inadvertently get trapped in it. Lets get the ‘geography’ of this whole thing down now. If you are traveling from earth to the Source Wall, you would pass through a couple places first. You would travel out of the Multiverse, through the Speed Force Wall, then into Sphere of the Gods AKA the Fourth World. This is where you will find New Genesis ruled by Highfather, and Apokolips ruled by Darkseid. Then past that is the space where the Monitors hang out and watch over the Multiverse. Right after that, the Source Wall, and then the Source. Now….Before Darkseid ruled Apokolips, there was his father Yuga Khan. He is also Highfather’s father. He was obsessed with discovering the incomprehensible mysteries of the universe, the beginning of it all, the Source. His failed attempt at penetrating the Source Wall left him imprisoned in it. At one point he broke out just to find himself imprisoned again. Stubborn guy huh? I guess he just seriously wants to unveil the mysteries of….well… Everything! In Yuga Khan’s time, he created these Mighty Metal Golems that are made from Nth Metal. We discovered in issue #27 that their purpose is to destroy Yuga Khan’s progeny, which are the New Gods, which is why they are fixated on killing them. They have been lying dormant until now. John Stewart leads an all our assault on these Golems right at the Source Wall. Sure enough, the Golems are already there prying Yuga Khan from his imprisonment. 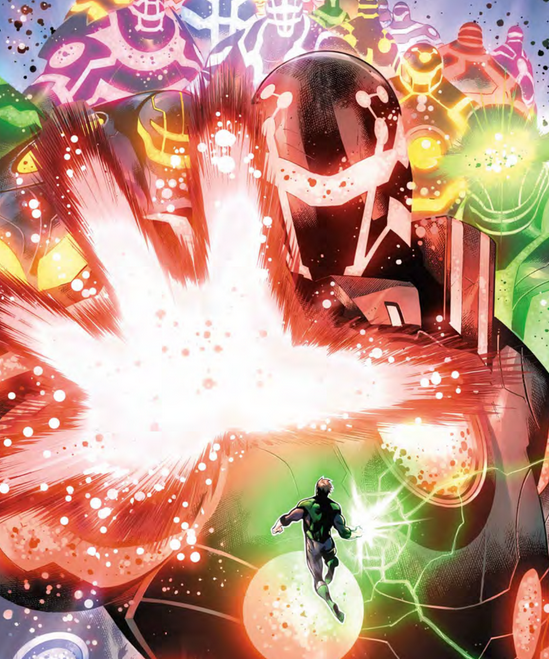 As the Lanterns struggle to subdue the Golems Hal Jordan shows up with Highfather still in his jet construct and the omega beams tailing close behind. Hal plays chicken with one of the Golems and gets the omega beams to hit it in the chest and it explodes. Then Guy Gardner hits another one in the chest and it too goes boom. So now our Lanterns start jacking these fools in the chest and they destroy all Golems that were present thus preventing Yuga Khan from escaping once more. Back on Mogo, Orion’s heart was restored and he is now awake. Kyle Rayner has collapsed in total exhaustion from holding the engine construct that kept Orion alive for so long. Orion is now in Rayners debt and the New Gods appear to be safe for the time being. Are all of the Mighty Metal Golems destroyed? Is Yuga Khan no longer a threat? We’re going to have to continue tuning in to Robert Venditti’s outstanding Hal Jordan and the Green Lantern Corps run. I actually really hope that we see more of Yuga Khan because it was such an interesting story, and to be honest I was looking forward to seeing him break out of the Source Wall and wreaking havoc. But what else can I say? This run was epic! When writers start diving into the stories involving the mystical Fourth World, Multiverse, The Source, etc… I’m a sucker. I feel like so much of it is based in real life ideas/ideologies and can be a real mind@#%$ to think about. The story is incredible, the artwork is so totally fantastic and tirelessly great to admire. Get this issue for the conclusion to a great story, and get it just to add it to your collection because it truly is that good. Next time in issue #30, we get to see Superman vs Hal Jordan. I will be looking forward to that.